The 16th Street Mall Garden Block (between Curtis and Champa streets) is a catalytic project for the revitalization and continued success of Denver’s premiere public space. 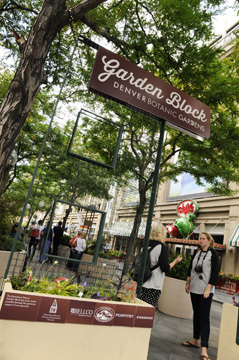 As a partnership between the Downtown Denver Business Improvement District and Denver Botanic Gardens, the Garden Block creates a unique destination on the Mall and for all of downtown Denver. The project creates a dynamic experience in a very urban space through the use of planters displaying a variety of themed landscapes and rotating annual and seasonal displays.